UPDATE: The Samsung Galaxy Watch is official – here are the details! If you haven't heard, Samsung has released a new smartwatch at a launch event today in New York. We originally expected it to be called the Samsung Gear S4, following on from the Gear S3 and Gear Sport. But it won't be called the Samsung Gear S4, it will actually be called the Samsung Galaxy Watch. Samsung Galaxy Watch vs Samsung Gear S3: What's changed? This has been confirmed by Samsung at the launch event. At Unpacked 2018, Samsung did not announce the Gear S4, as we initially thought it would be, it was called the Galaxy Watch. This big rebrand is an attempt to generate sales, and shake of the poor selling Gear range. The launch proves the Gear S4 is dead. As well as a new name, we saw a new design, in two sizes and a new Rose gold colourway. It also has a battery life which lasts "several days". Samsung also answered the question as to what software it will run, with early reports suggesting it would be Google's Wear OS, but later rumours stating Samsung would stick with its own wearable operating system, Tizen. The Galaxy Watch does, in fact, run Tizen, which Bixby also on your wrist. 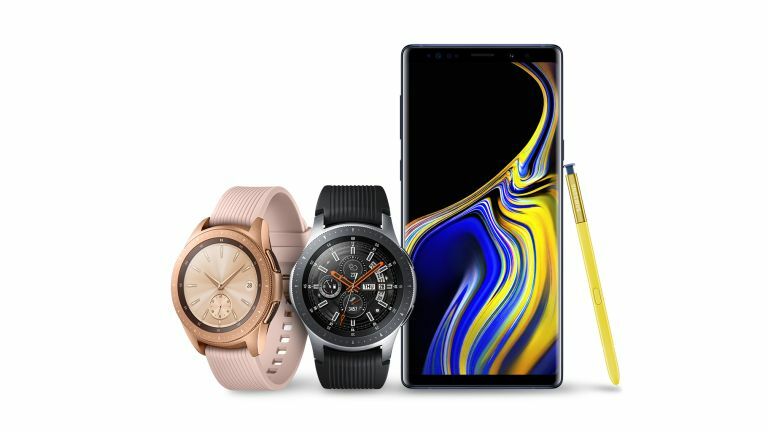 Three variations of the Samsung Galaxy Watch. You can watch the livestream now. It's available to follow on Samsung's website, Youtube, and Twitter. You can find out more in our story Samsung Galaxy Watch: Samsung's new smartwatch is official.